How did they get here? It’s a question I can’t help asking myself, every time I see a child rescued from the sea. This time it’s a boy of perhaps 17. Ali* (*name changed for security) is in our on-board clinic, just a few hours after we picked him up following his life-threatening ordeal at sea. His body is cramping due to malnutrition. He can barely speak. As I help him to eat he slowly regains some strength and manages a whisper. He gestures to his injured foot. I realize he is describing how it happened. His wounds are the result of torture in Libya. How he got here becomes a little clearer, a small part of the puzzle solved. Search and Rescue’s Team Leader, Gillian, assists in the rescue of over 300 refugees and migrants from an overloaded boat in distress. “I think I can see something”, said a member of my team earlier that morning, binoculars raised. On the horizon, a microscopic black dot. It appears then disappears. It is 7:15 a.m. and we have been scouring the horizon since first light. A second opinion from our captain is equally inconclusive. As we move closer to investigate the outline of a tightly packed rubber boat soon becomes clear. The dinghy would not have lasted long. It was beginning to deflate and no one was wearing a life jacket. After notifying the Italian coastguard and getting their approval to proceed we approach and find more than 100 people crammed on the flimsy dinghy. We deploy our fast rescue boats and soon they are aboard our search & rescue ship, the Vos Hestia. Around a quarter are children. Later that day we took on board 100 more from another rescue ship. Ali was among them. We’ve been told we’re part of the problem, and even that we are colluding with the same smugglers who callously cast people off from the shores of north Africa in the dark, early hours of the morning knowing full well the coming sunrise might be the last their ‘clients’ ever see. This is categorically untrue. Those making these allegations are making assumptions that just aren’t factual. We never communicate with traffickers or people smugglers and only operate in international waters. We find refugees and migrants in distress through collaboration with other NGO vessels and the Italian coastguard and frankly, a huge dose of luck – luck that is still sadly absent for too many. Last year was the deadliest on record for people crossing the Mediterranean. Altogether around 5,000 refugees and migrants lost their lives. Close to 1,000 people have already died trying to cross this year. 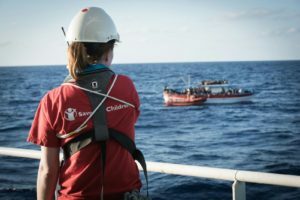 Save the Children’s crew on board the Vos Hestia are fighting against the odds every day to limit the needless loss of life in the Mediterranean. We never know when the call will come. My team go to bed in their cabins each night knowing they could be roused at any moment. Just last weekend search and rescue capacity was pushed to breaking point. Our sole mission is to save the lives of people, particularly children, who are escaping violence, persecution and extreme poverty. We save people from the very real threat of drowning and protect the children we bring aboard. If the search and rescue efforts of NGOs like ours stopped, the death toll would only increase further. We have also seen little evidence that the reduction of search and rescue missions leads to a decrease in attempts to cross the Mediterranean. The presence of search and rescue does not imply more people will cross, it simply means those who do are more likely to survive. We shouldn’t be all that’s stopping the desperate search for safety from becoming a death sentence. But that is the situation we are in. Smugglers are knowingly endangering the lives of people seeking better futures at extortionate costs and extreme conditions. ‘How did they get here?’ We ask it every day. The answer is violence, poverty and exploitation. The evidence shows that we make it more likely Ali and others like him will survive. To learn more about our Search and Rescue Response, click here.